In a small office at the back of a deserted high school, Gwyeth Smith Jr. was puzzling over the college admissions season that had recently ended — the cruelest in his thirty-plus years of working with applicants. This excerpt gives a sense of Smitty’s magical way of dealing with applicants. Smitty, as friends called him, was the director of guidance at Oyster Bay High School on Long Island’s North Shore. He had close- cropped salt-and-pepper hair, a matching mustache and beard, and looked younger than his sixty-two years. It was a humid morning in August 2007, a week before the start of classes, and he was clearing his desk to prepare for the fall rush. He studied a newspaper clipping about a nearby school’s dismal luck with the Ivy League. The school, Northport High, prided itself on its two dozen Advanced Placement courses, its arts program, and its service project in Central America. Little of that had swayed the Ivies this time. In all, Harvard, Yale, Princeton, and Brown had accepted just three of Northport’s thirty-one applications. Every high school in the area except Oyster Bay had been hit hard by rejections. A few miles away, the Mineola guidance department was baffled by MIT’s snub of their salutatorian, a science whiz with near-perfect SATs. At John F. Kennedy High, on the South Shore, eight of nine University of Pennsylvania applicants were turned down, along with all seven who tried for Washington University in St. Louis. Across the country, counselors could list student council presidents, Eagle Scouts and scholar-athletes who’d been spurned by first- , second- , and third-choice schools. The acceptance rates at the colleges explained why. Penn took only 15.9 percent of applicants, Stanford 10.3 percent, Columbia 8.9 percent. Duke rebuffed more than half of the 1,381 valedictorians who applied. And it wasn’t just the elite private schools. Binghamton, of the State University of New York system, had gotten so many early applications that thousands had to be put off for decision until spring. Even safety schools were no longer safe: The University of Miami, once derided as “Suntan U,” got nearly twenty thousand applications for two thousand openings. And yet Smitty was serene. Most of the kids at his small public high school were admitted to their first-choice colleges, and many had sorted through competing offers. A boy who floundered at the start of the admissions process was accepted at all seven schools he applied to; he’d chosen Rice over Cornell. One girl hadn’t just gotten into MIT, she had actually rejected MIT. Instead, she accepted a scholarship to Case Western Reserve, where professors requested her help on a research project. Smitty had made sure that Oyster Bay was one of the first districts in the area to buy software called Naviance, which displayed scattergrams with students’ scores and GPAs and a summary of where they’d been accepted or rejected. What made the acceptances more remarkable was that Oyster Bay was not a school of national stature. For decades it had been overshadowed by its neighbors, Syosset, Cold Spring Harbor, and Jericho, which dominated science competitions and churned out National Merit finalists. Some of the best public schools in the country could be found across the Long Island Sound: Scarsdale and Chappaqua, Greenwich and Westport. And just down the road were the academic bastions of Great Neck and Port Washington, better known to generations of The Great Gatsby readers as West Egg and East Egg. But Oyster Bay had Smitty. Parents called him the “guidance guru.” Few counselors, they said, lived and breathed the applications game like Smitty. He could find the perfect school for the most quirky kid, coax a sensitive essay from the toughest jock, and induce the nerdiest engineering student to exude poise in an interview. “The application process is all about discovering who you are.” That was one of Smitty’s sayings. So was, “Everyone has a story to tell.” His job, he liked to say, was not to simply flaunt scores but to get students to present their most compelling selves to admissions offices. 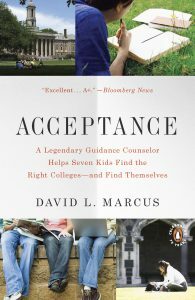 Help your child ace the the college admissions process!